Hacking College Admissions – Bill Demirkapi's Blog – The adventures of a 17 year old security researcher. The adventures of a 17 year old security researcher. Getting into college is one of the more stressful time of a high school student’s life. Since the admissions process can be quite subjective, students have to consider a variety of factors to convince the admissions officers that “they’re the one”. Some families do as much as they can to improve their chances - even going as far as trying to cheat the system. For wealthier families, this might be donating a very large amount to the school or as we’ve heard in the news recently, bribing school officials. If you don’t know about me already, I’m a 17-year-old high school senior that has an extreme interest in the information security field and was part of the college admissions process this year. Being part of the college admissions process made me interested in investigating, “Can you hack yourself into a school?”. In this article, I’ll be looking into TargetX, a “Student Lifecycle Solution for Higher Education” that serves several schools. All of this research was because of my genuine interest in security, not because I wanted to get into a school through malicious means. The school I applied to that was using TargetX was the Worcester Polytechnic Institute in Worcester, Massachusetts. After submitting my application on the Common App, an online portal used to apply to hundreds of schools, I received an email to register on their admissions portal. The URL was the first thing that shot out at me, https://wpicommunity.force.com/apply. 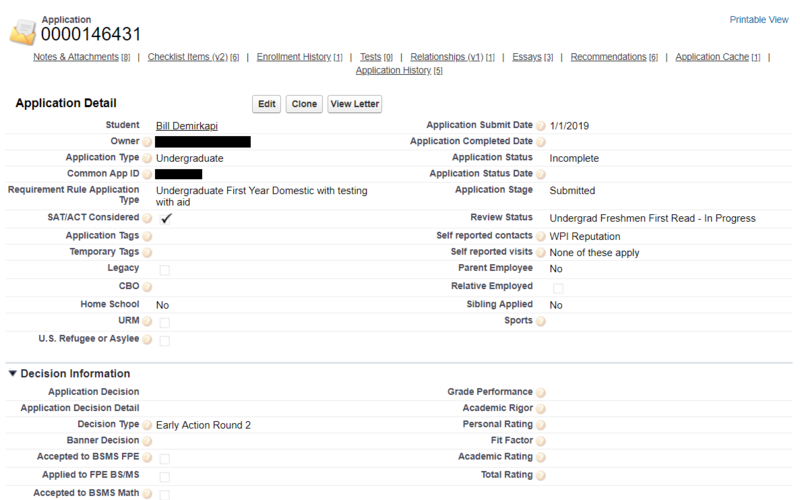 Force.com reminded me of Salesforce and at first I didn’t think Salesforce did college admissions portals. Visiting force.com brought me to their product page for their “Lightning Platform” software. It looked like it was a website building system for businesses. I thought the college might have made their own system, but when I looked at the source of the registration page it referred to something else called TargetX. This is how I found out that TargetX was simply using Salesforce’s “Lightning Platform” to create a college admissions portal. After registering, I started to analyze what was being accessed. At the same time, I was considering that this was a Salesforce Lightning Platform. First, I found their REST api platform hinged on a route called “apexremote”, this turned out to be Salesforce’s way of exposing classes to clients through REST. Here is the documentation for that. Fortunately, WPI had configured it correctly so that you could only access API’s that you were supposed to access and it was pretty shut down. I thought about other API’s Salesforce might expose and found out they had a separate REST/SOAP API too. In WPI’s case, they did a good job restricting this API from student users, but in general this is a great attack vector (I found this API exposed on a different Salesforce site). 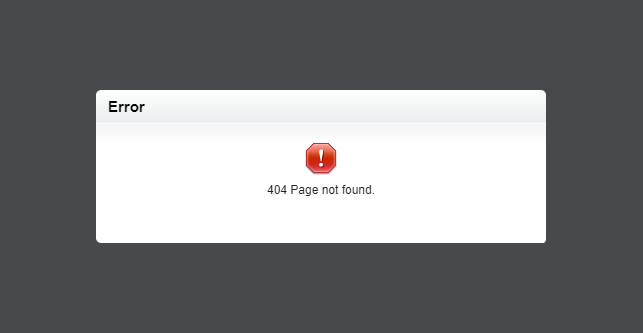 It looked like a standard 404 page. What caught my eye was the search bar on the top right. I started playing around with the values and found out it supported basic wildcards. I typed my name and used an asterick to see if I could find anything. Sorry for censoring, but the details included some sensitive details. It seemed as though I could access my own “Application Form” and contact. I was not able to access the application of any other students which gave a sigh of relief, but it soon turned out that just being able to access my own application was severe enough. 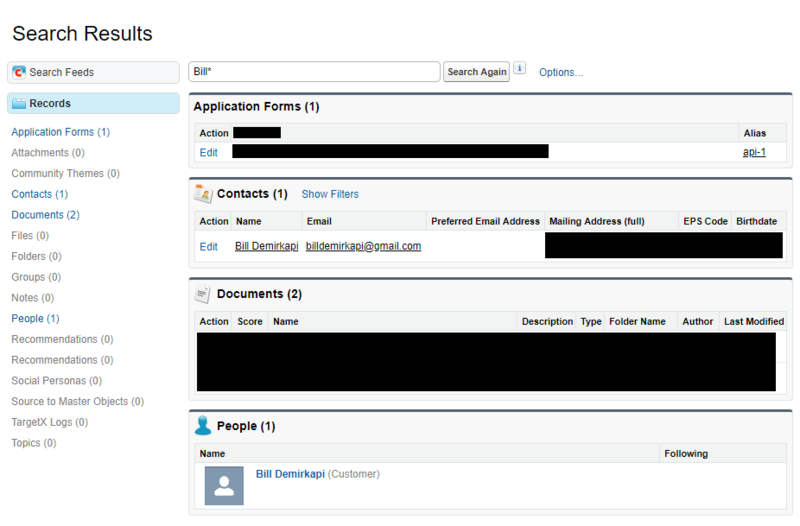 After clicking on my name in the People section, I saw that there was an application record assigned to me. I clicked on it and then it redirected me to a page with a significant amount of information. Don’t worry, I didn’t accept myself into any schools or make my SAT Scores a 1600. After finding this vulnerability, I immediately reached out to WPI’s security team the same day to let them know about the vulnerabilities I found. They were very receptive and within a day they applied their first “patch”. Whenever I tried accessing the backend panel, I would see my screen flash for a quick second and then a 404 Message popped up. This gave me a good chuckle. What they were doing was stopping the page from loading and then replacing the HTML with a 404 error. I could just use NoScript, but I decided to create a simple userscript to disable their tiny “fix”. Basically, this userscript will re-request the page and remove any “404” script blocks then set the current page to the updated html. It worked great and bypassed their fix. As suspected, WPI only put a “band aid over the issue” to stop any immediate attacks. What I later learned when looking at some other schools was that TargetX themselves added the script under the name “TXPageStopper” - this wasn’t just WPI’s fix. It’s important to note that if you tried this today, sure the 404 page would be removed, but nothing is accessible. They’ve had this patch since January and after doing a real patch to fix the actual issue, they just never removed the 404 page stopper. This is going to be a small section about my interactions with WPI after sending them the vulnerability details. I first found and reported this vulnerability back in January, specifically the third. WPI was very responsive (often replied within hours). I contacted them on February 14th again asking how the vulnerability patch was going and whether or not this was a vulnerability in only WPI or it was a vulnerability in TargetX too. Again within an hour, WPI responded saying that they have fixed the issues and that they had a “final meeting set up for the incident review”. They said, “It was a combination of a TargetX vulnerability as well as tightening up some of our security settings”. I immediately (within 8 minutes) replied to their email asking for the TargetX side of the vulnerability to apply for a CVE. This is when things turned sour. Five days past and there was no reply. I sent a follow-up email to check in. I sent another follow up the next week and the week after that. Complete radio silence. By March 16th, I decided to send a final email letting them know that I had intended to publish about the vulnerability that week, but this time I CC’d the boss of the person I was in contact with. We will reach out to TargetX tomorrow and determine and confirm the exact details of what we are able to release to you. I will be in touch in a day or two with additional information once we have talked with TargetX. We would prefer that you not release any blog posts until we can follow-up with TargetX. Thank you. Of course if the vulnerability had not been completely patched yet, I did not want to bring any attention to it. I sent back an email appreciating their response and that I looked forward to their response. A week past. I sent a follow up email asking on the status of things. No response. I sent another follow up the next week and this time I mentioned that I again was planning to publish. Radio silence. It has been about a week since I sent that email and because I have had no response from them, I decided to publish given that they had said they had patched the vulnerability and because I could not extract any more data. I named this post “Hacking College Admissions” because this vulnerability was not just in WPI. Besides WPI confirming this to me themselves, I found similar vulnerabilities in other schools that were using the TargetX platform. To find other schools impacted, I found all of the subdomains of force.com and tried to find universities. I am sure I missed some schools, but this is a small list of the other schools affected. There are some schools that appeared to be running on the same Salesforce platform, but on a custom domain which is probably why I missed schools. It turns out, having lots of money isn’t the only way to get into your dream college and yes, you can “Hack yourself into a school”. The scary part about my findings was that at least WPI was vulnerable since they implemented the Salesforce system in 2012. Maybe students should be taking a better look at the systems around them, because all I can imagine is if someone found something like this and used it to cheat the system. I hope you enjoyed the article and feel free to message me if you have any questions.